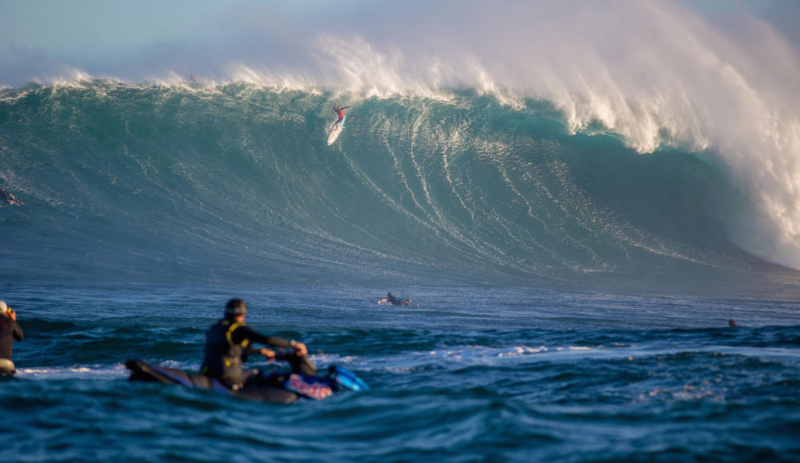 Today, the World Surf League (WSL) Big Wave Tour (BWT) is placing the Pe’ahi Challenge in Haiku, Hawaii on Green Alert to potentially commence at 2pm (local time) on Thursday, November 10, 2016 with a projected 30-foot-plus swell heading towards the region. “We have been tracking a storm from the Pacific Northwest and anticipate a promising swell to deliver for our first BWT event of the Northern Hemisphere season,” said Peter Mel, WSL BWT Commissioner. “We’re incredibly proud to be introducing a women’s event this season,” Mel continued. Pe’ahi, known as “Jaws,” breaks off the northern coastline of Maui with the ability to produce waves in excess of 60 feet. The event premiered on the BWT last winter with exceptional performances in epic conditions. All eyes will be on this venue this year to see the top ranked BWT surfers take on the monstrous conditions. Another strong winter storm is currently sliding across the Bering Sea/Aleutians, packing a good fetch for Hawaii with wind speeds up to 35-50kts. Meanwhile, the same storm that pushed out the current NNW pulse is still holding a fetch aimed at the Islands, but now located up in the Gulf of Alaska.